An optical hand type, although I have a digital one on order (I really do find refractometers handy in the mash, and this should simplify my brewing.) Again, don't really need it post boil, just curious. Try that new one once you'll get it. I'm pretty sure you'll get much better results. 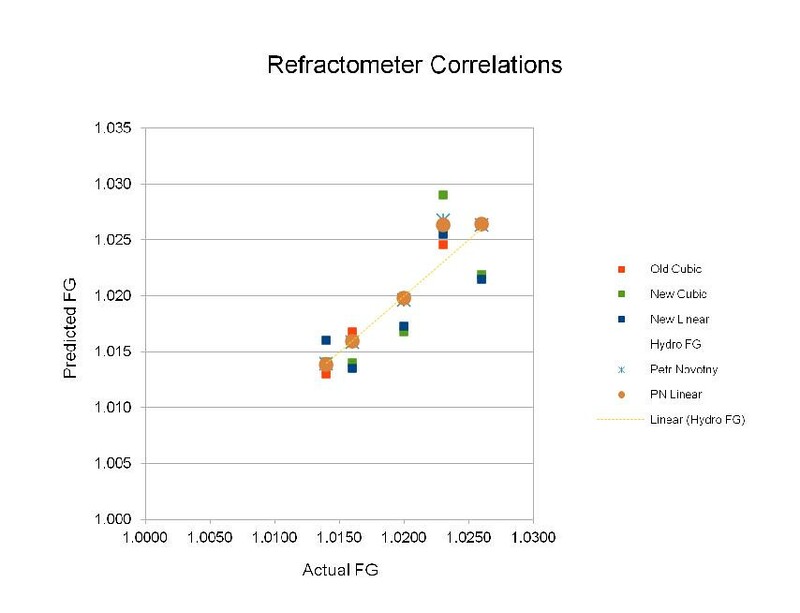 I suspect that your refractometer is faulty such great deviation is simply not physically possible if the instrument and its use is ok.
No problem. I guess it does support that. Wort correction factor should be characteristic of the instrument, not each batch. But it is at least simple to create specific ones. I just note WRI at each stage of mash and boil, take a saccharometer and refractometer reading on chilled wort, and work backwards to correct the earlier readings. These could all be compiled to come up with a single, instrument-specific number, but as I take all these measurements anyway, it's simple and gives me a tool for tracking the progress of the mash, batch to batch, under different conditions. I'll be more interested in coming up with a single conversion factor on the digital instrument, so I'll be able to quickly and easily get an actual density reading on the fly. Thanks again for your help. You can hopefully see a very light thin line diagonally from lower left to upper right -- that is the "goal line". Goal is to be right on that line. Just a quick note to let you guys know that 3 additional data points since February also fall directly on the diagonal line for the Novotny Linear formula, and the one Terrill calls "Old Cubic". I'm sold. I feel very comfortable using my refractometer for FG readings whenever I want, always accurate within 0.001 which I'd say is good enough. I'll join the zombies.... Petr was right about my results improving with my digital refractometer. I've been using it long enough to conclude that its correction factor is effectively nonexistent, 1.00, with any apparent discrepancy with saccharometer readings attributable to the vagaries of eyeballing a thing floating in turbid, bubbly liquid. I am now confidently using mine throughout the process from mash to FG. I'm using the BF calculator which uses the Novotný cubic I believe, but this and the two Dave mentions all converge pretty closely and all, as Dave says, "close enough." In fact, I'd go along with "dead nuts." I’ve recently received a Speidel Braumeister 20L so I’m back to just using a hydrometer post brewday to take readings. My handheld refractometer is great for brewday measurements. Had to created a forum profile just so I could say thank you all for this thread. It has been tremendously informative and after switching from hydro to refract cold turkey a few brews ago it has really hit home that I should probably do a few comparisons at least to get my correction factor dialed in. Looking forward to finding more rabbit holes to dive down here. Thanks again! Sorry for waking up a dead thread again, but out of curiosity, which digital refractometer did you end up buying, Robert? Hanna HI96811. Can't remember if I bought it direct from Hanna, or elsewhere, I think MoreBeer carries this one. Anyway, it's working great for me. Update to the last post there, I've made my own spreadsheet using Petr's equation, and am very happily floaty-thing-free. I like small expensive toys.